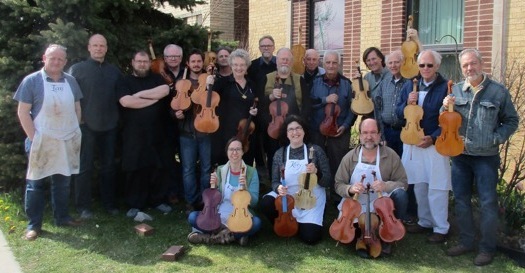 Workshop: Practical and Artistic Violin Varnishing 2019 - Violin Varnish Ltd.
Directors: Joe Robson, Marilyn Wallin, Todd Goldenberg. The workshop focus is on application. Understanding the components and interaction of the materials will be addressed as we varnish. Participants are required to bring two instruments. One in the white and one prepared with a Ground. Each of the directors will also varnish an instrument during the workshop. Matching the maker’s vision of the finished instrument to the correct materials and application techniques allows varnishing to be an intentional and controlled part of violin making.